Thank you for exploring ways you can support St. Thomas More Collegiate (STMC). As a Catholic independent secondary school, STMC relies on philanthropic gifts as one of its key sources of funds. Tuition fees and government grants alone do not cover the actual cost of providing the solid and well-rounded secondary education our Knights receive and enjoy. 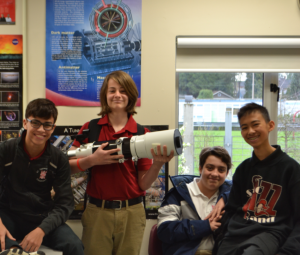 With donor support, our school is able to provide every Knight a transformational learning experience through innovative curricular and co-curricular programs, state-of-the-art facilities, outstanding faculty and staff, and up-to-date teaching and learning tools and equipment. Thanks to the many dedicated members of our community who have selflessly given their time, talent, and treasure over the years, the school continues to thrive and grow. When you give to STMC, you help make great things happen. As you consider making a gift to STMC, think of it as an investment in the present and future generations for a better society. Because it matters to our students, to our community, and to our society.